For most drop ceiling installations, a basic layout procedure will do just fine. However if you’re looking for that professional touch, you’ll want to consider spending a little more time figuring out exactly how you’ll be installing your new drop ceiling. It’s imperative that as a professional, I spend time with my customers figuring out exactly what the ceiling heights should be and deciding where the exact location of fixtures or other units are to be installed into the ceiling. 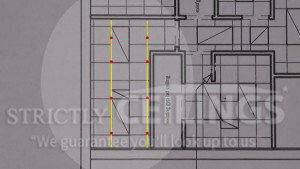 Some building codes require a minimum height clearance and this makes learning proper layout techniques even more important. In larger more complex basements that involve suspended ceiling drops, many factors are considered in the layout of the drop ceiling to maximize border efficiency and to eliminate waste. As with any drop ceiling project, take time to assess the room. Look at the overall size and shape of the room. 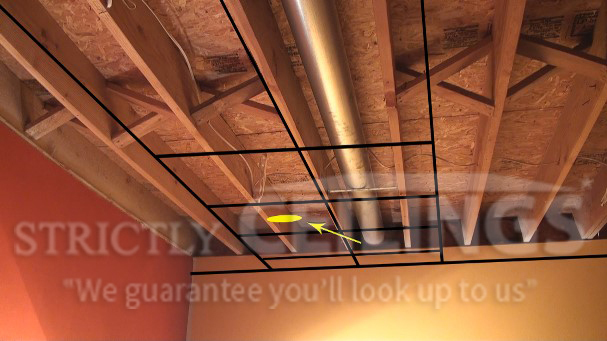 Assess the potential height of the ceiling and if there are any obstructions like ductwork in the way. As a professional, I like to temporarily install a laser level so that we have a level line across the entire room. This way I can check for clearances to pipes, ductwork or electrical boxes. Assess the structure above and remember that you will always install your wires and main runners perpendicular to the joist. At this point you should also know whether you’re installing a 2×4 or 2×2 ceiling tile. Most basement drop ceilings will not have a blueprint to scale off of, so everything that you do will be based on your own calculations. The very first thing you should do is determine what type of fixtures are being installed. If they are can-lights you will have more flexibility as they can be tucked up inside the joist. An inexpensive way to install lighting is to hang a 4’ fluorescent strip light above the ceiling inside the floor joists and place translucent panels in the ceiling grid. 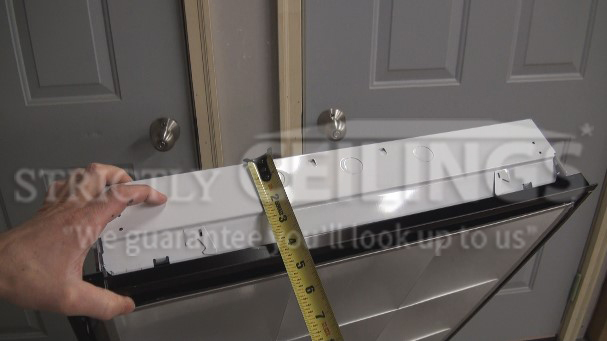 If you are using lay-in fixtures like a fluorescent 2×4 fixture then you will need to measure the height of the fixture and add at least 1” so that you will have room to install the fixture into the grid. Once you’ve decided what fixtures will be installed, you need to determine the exact ceiling height, keeping in mind the depth of the fixtures. Decide the approximate location of the lights and see if there are any obstructions like pipes or ductwork in the way. 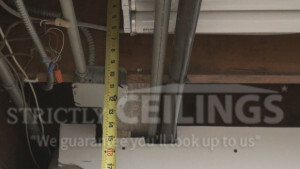 Allow proper clearance for these to help determine the ceiling height. Sketch the room out on a piece of paper and measure the overall length and width of the room and write the dimensions down. Equalize the borders by adding field tiles into the room and subtracting the total # of field tiles by the total width of the room. Example: Room is 34’6” and a 2×2 ceiling. Total field tiles can be either 16 or 17 tiles. 16 field tiles total 32’. 34’6”- 32’ = 2’6”. Divide in 2 and the border should be 1’3” on each side. 17 field tiles total 34’. 34’6”- 34 = 6”. Divide in 2 and the border on each side would be 3”. Determine which would work better by measuring from the wall to the joist and make sure that the can-light or light fixture will fit. You can mark this out on the floor as well to verify light location. Check both the width and length before proceeding. You may need to shift the grid one way or the other to allow for all fixtures to fit. 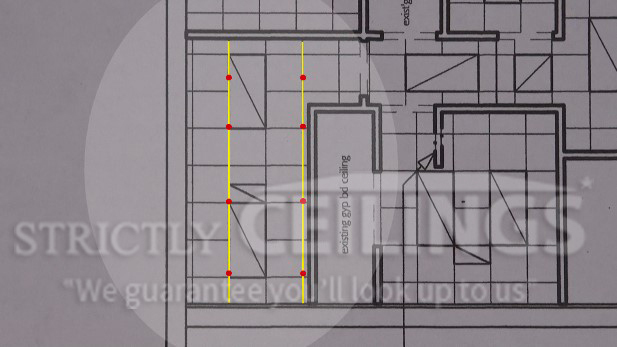 Once the ceiling height and border dimensions have been determined you need to decide where the drop ceiling wires will be placed. Remember, main runners will always be installed perpendicular to the structure above and therefore the ceiling wires will be as well. You can determine where wires should be placed in one of two ways. If we use the border dimension from our previous example of 1’3” then the main runner would run 1’3” off the wall. Because we are using a 2×2 ceiling grid then we could install the main runner at 1’3” or 3’3” off the wall. A main runner can be installed anywhere from 0’ – 4’ off the wall. If we choose 3’3” then we would use a 4’ cross tee to cut in our first row of grid along the wall. 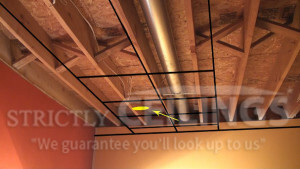 This is a great way to pre-plan the ceiling before you start to install to avoid future problems. Verify the structure above to see if you can install the main runners and wires at 1’3” off the wall. If there are too many pipes or ductwork in the way then move the main runner over to 3’3” and check the structure in this area along the entire run. Drop ceiling wires should start at about 30” off the wall in-line with the main runner. They are then placed every 4’ o.c. down the length of the main runner until you reach the end of the run. Most drop ceiling grid systems consist of a 4’ cross tee configuration and therefore main runners as well as the ceiling wires will be spaced every 4’ apart. When installing ceiling wires just remember 4×4. 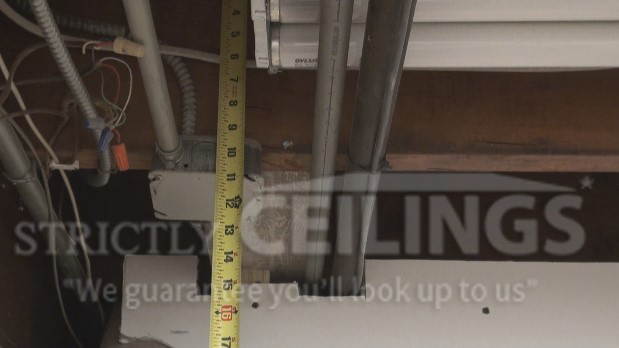 There should be a ceiling wire at every 4’ corner on the ceiling grid. If this whole process sounds confusing you may want to watch the full video as we layout three different types of ceilings including an L-shaped basement with no blueprints.